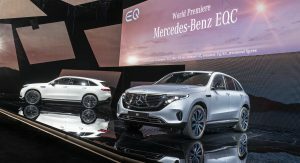 Mercedes has finally revealed the production version of the battery-electric EQC SUV, giving the world a first look before production begins at the Bremen plant in 2019. 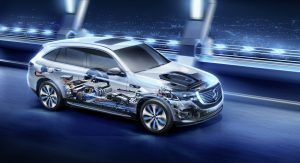 Τhe EQC’s pair of electric motors provide a combined 402hp (407PS) and 564lb-ft (765Nm) of torque, which is enough to send the electric crossover from 0 to 62mph (100km/h) in 5.1 seconds. 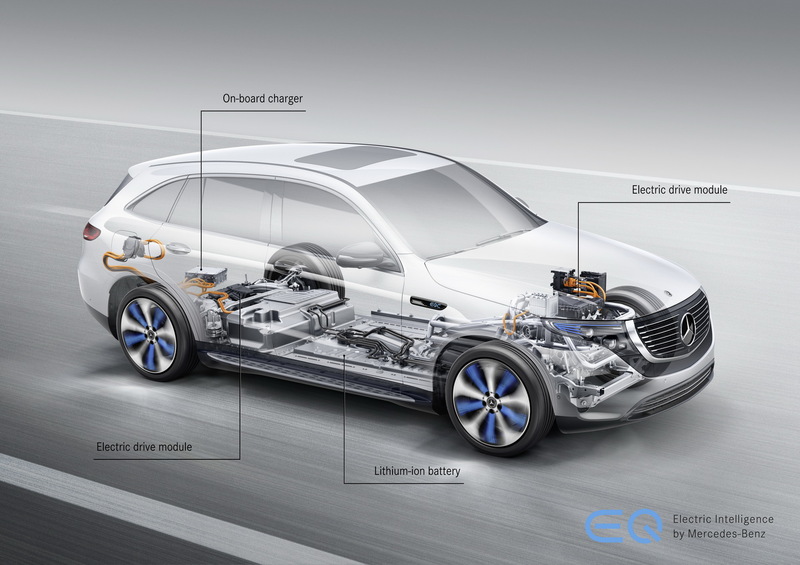 A 80kWh battery pack mounted on the floor between the axles provides the EQC with the ability to travel for more than 279 miles (450km) on the NEDC cycle. 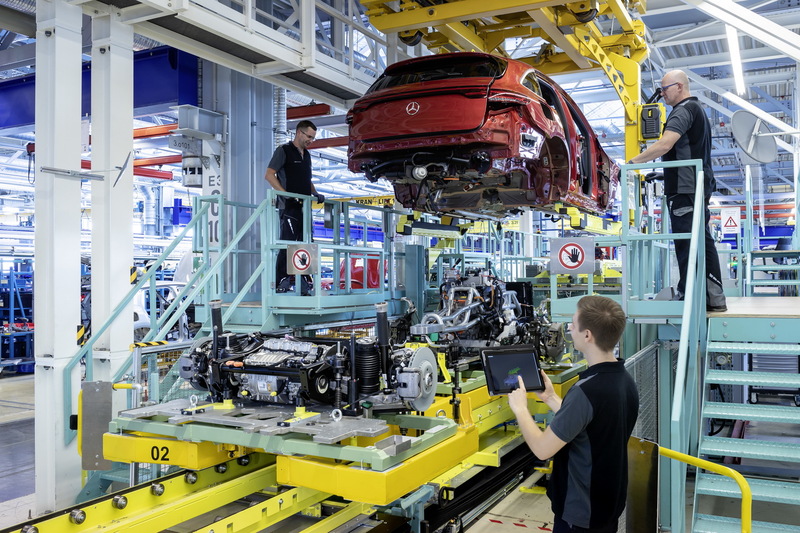 In theory, having an electric powertrain gives the opportunity to designers and engineers to explore new packaging ideas, since the electric motors require far less space and extra components when compared to an internal combustion powertrain. That’s why electric cars like Teslas offer a front trunk, or frunk as it’s called these days, in addition to the classic boot at the rear. 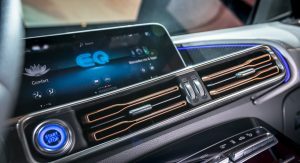 However, the EQC lacks such a feature, for the simple reason that under its bonnet, in the same space you would normally find an internal combustion engine, there’s the front drive module. 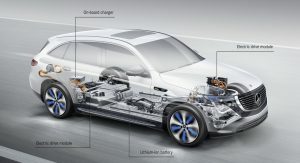 The module houses the motor and the single-speed transmission together and sits in a cradle that’s isolated with rubber mounts, for noise-canceling reasons, at two points: where the module is connected to the subframe and where the subframe connects to the body. 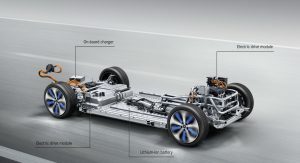 You see, there’s the important issue of efficient series production; Mercedes deemed it would be much harder (and more expensive) to efficiently mass produce an electric vehicle that features a totally different layout than its current models. 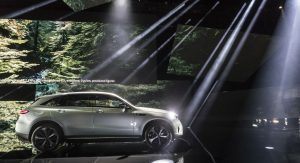 Instead, the German car maker opted to design and engineer its electric SUV in a way that it will allow them to integrate its production to its existing manufacturing standards. 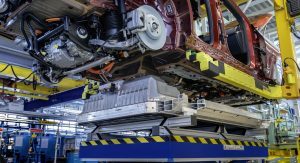 The front drive module and the rear axle assembly arrive at the factory already bolted to their subframes before being installed to the chassis, followed by mounting the battery pack to the floor. 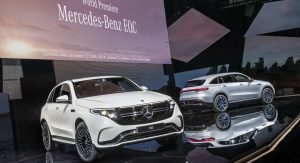 Don’t forget that the EQC will be produced on the same line with the C-Class, GLC and GLC Coupe at Bremen. 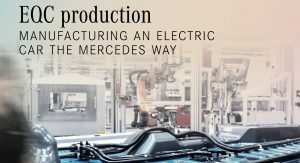 By integrating electric models into existing production lines, Mercedes gains a major advantage in the industry, making its plants instantly ready to adapt their production lines for all types of models, and that includes anything from combustion engines to hybrid and electric powertrains. 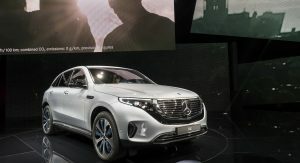 Sounds like the three-pointed star has solved the headache of EV mass production before it even starts building its first battery-electric vehicle. Why is floor not flat on the inside? That, and many FWD platforms are also made to accommodate AWD versions. Here is another reason why Tesla is winning. They don’t have to rely on ancient architecture. How much cooler and practical it is to have another boot! 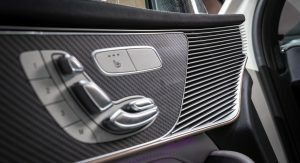 Mercedes didn’t have to rely on ancient architecture it chose to do so. That is the purpose of this article. 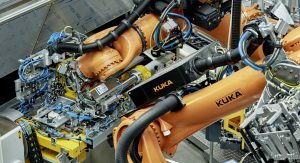 Which is the same thing: “it will allow them to integrate its production to its existing manufacturing standards”. 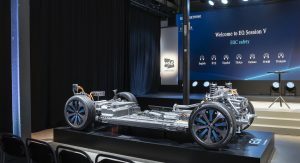 Tesla (or any other full EV company for that matter) doesn’t need to care about ICE cars produced on the same line so they can use the advantage of a fully electric design. Choosing to do something vs having to do something is clearly not the same. What architecture could Tesla have pulled from? Clearly none so hey had to create something from scratch. 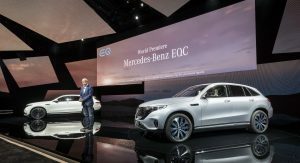 Mercedes chose to use a common platform so say for instance their EQC Dpnt sell they are not ladeled with the cost of developing an entirely new platform. Sounds like a smart move to me because the number 1 luxury automaker isn’t struggling with money. Tesla way isn’t the only way contrary to some people’s opinion. Are you saying you prefer a company to make bigger profit rather than giving you a better product? Also you compare a century old established company with all the infrastructure ready and paid for with a startup decade old one that has to first establish the basics. I do not care the least bit if they make profit or not, I care about the product I get. 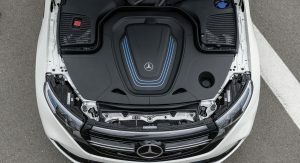 Not having flat floor or frunk is clearly cost saving on Merc’s part on the cost of the customer. Sad! I said what I said. Tesla’s way is not the only way. 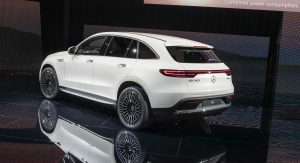 Clearly it’s not your way either but Mercedes looked at what made financial sense for them AND PLEASE STOP making it sound as though you’re getting a Nissan Leaf for Mercedes prices. 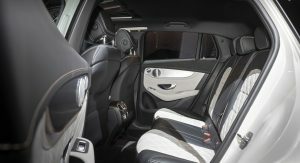 You want a bespoke architecture, latest tech, and I bet you want Mercedes interiors for (let me guess) 50k-60k. You don’t want them to make a profit because you want an awe inspiring car that’s better than a Tesla in every way for a reasonable price. For such supposed car fans I really feel like a lot of you all do not know what goes into making a vehicle. Let’s see the price of this EQC. 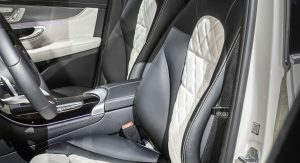 If it will be on par or more expensive than a Model X then I couldn’t care less about the more plush interior. 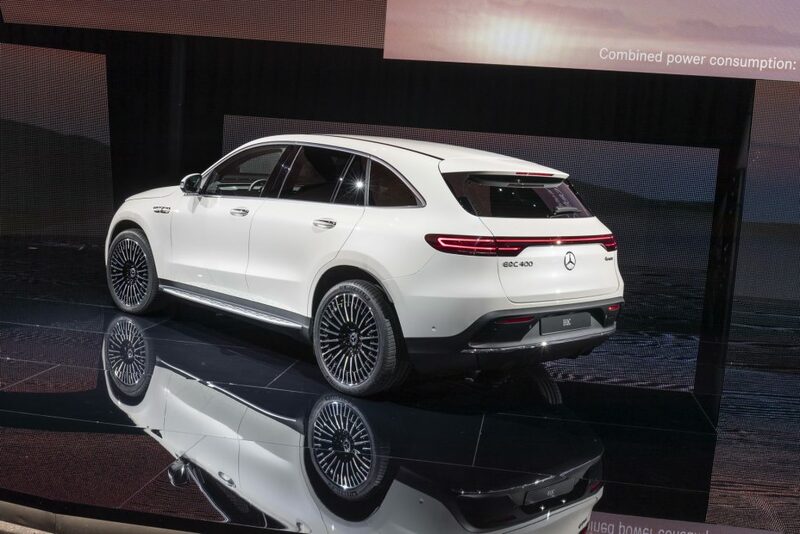 In my opinion the fake exhaust, the lack of frunk, the lack of flat floor are all lame from a company like Merc. The 110kw charge limit as well. 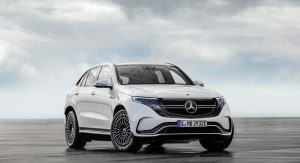 How does it feel to buy a Mercedes and then having to wait longer for charging than a Tesla owner? Let alone that Merc doesn’t even have the infrastructure. People don’t understand that Tesla is not making profit because they made investments that will pay off long term, e.g. : the thousands of superchargers all over the world. 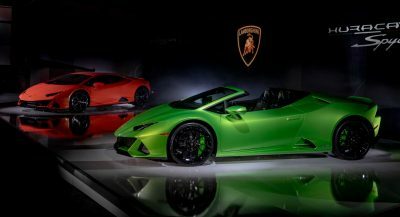 The price will tell if they can sell this car and produce it in greater numbers. I doubt it. The Vmax limitation at 180k/h seems for Germany a nogo… Will see. 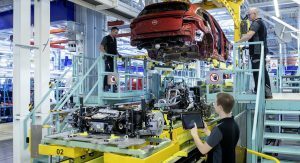 It chose to do so in order to reduce costs and thus increase profits, but the customer will not get the full benefit of the electric technology. However, they will at least provide good build quality, which is needed in this market. But they could’ve gone the full monty and built a real Tesla killer. They stopped just short of the goal. Whose goal is it? Your goal or theirs because we know they are not strapped for cash so maybe that wasn’t their goal. Wouldn’t the goal be to build a better electric car than Tesla? And if M-B isn’t strapped for cash…? Goal is to earn money! So not “The best or nothing, ” then? I have to agree here. 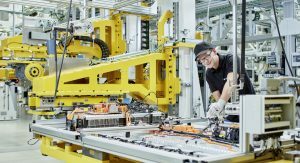 Electric technology should be exploited down to the very last advantage in order to really benefit the consumer and advance the technology further. But of course, this also has to make sense from a financial point of view. At first sight Tesla’s architecture looks much more advanced than the EQC, but it doesn’t seem to make sense financially at this point in time, looking at their financial struggles. But for the consumer, it’s a good thing, Tesla cars are good bang for the buck at this point in time. They are not winning yet! 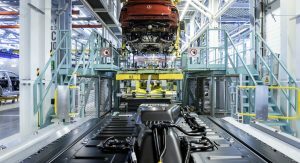 The reason Tesla *isn’t* winning is that it can’t manufacture to decent standards and it doesn’t have the production capabilities with the same speed/quality as Mercedes will be able to manage with immediate effect. MB decided quality/production capability > coolness of a seocnd boot. 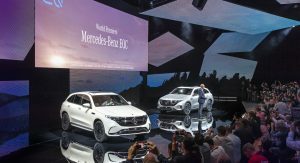 Merc has a stable CEO (several) at the helm.. A crucial difference. 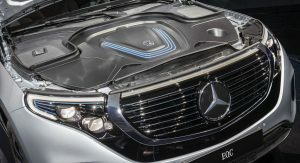 So Mercedes intentionally sacrificed storage space so that they could use platform sharing. Or in other words, Mercedes built a worse vehicle to save them money. And you think this is a brilliant move? Sorry, I’d rather buy the better vehicle. 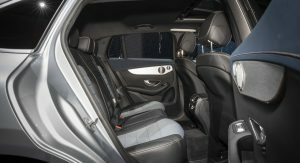 I believe sacrificing a boot at the front (which, let’s be honest here, hasn’t be a main issue in car design for over a century) to save the literal expense of making the car only accessible at a higher price point to factor in unique manufacturing process’. 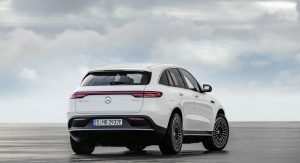 You have to look at the sustainability side for the company – I doubt they’ll want to pull a Tesla and struggle to make a vehicle reach a certain price point because MB have decided to over-engineer a simple solution. 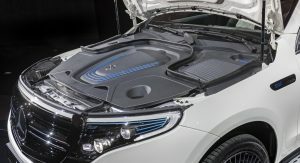 Though also, as the article says, being based on current ICE production lines means more models can have an EV treatment in a much shorter space of time. 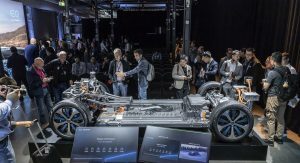 This is exceptional engineering in the EV world, and one I no doubt will push them to the front of the EV market. It enables them to build products faster that integrate some aspects of the latest tech while keeping costs low. 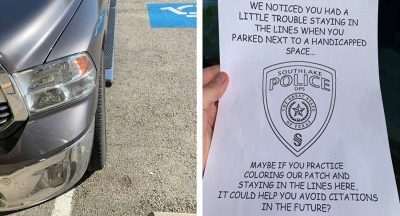 Its sop in any new vehicle. The alternative is to not deliver the features at all expect in a dedicated platform that may never take off. Sorry, you dont get it. ,,Mercedes-Βενζ ” First sentence in your article. Hay, I just saw Tim Cook’s Twin brother in Pic. 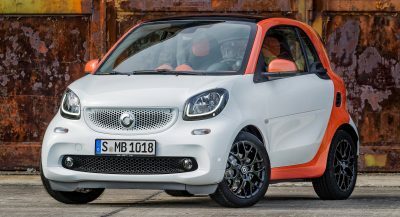 32..
It’s an electric vehicle, so load it up with lots of unnecessary, power-robbing lighting elements. Lame. 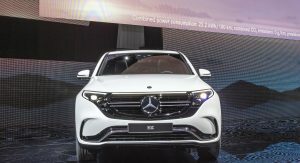 This is just another indication that Mercedes is going to remain focused on conventional ICE vehicles, with only the minimal amount of effort toward EV’s for appearances. 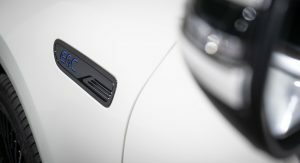 There is an EV benchmark on the market today. The Model S has been around for six years. The Model X, two years ago. 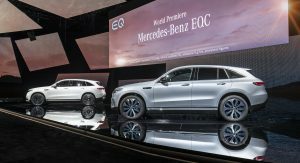 The EQC will be available starting at the end of 2019 or maybe early 2020 in the US. There is no excuse for it not to be more competitive than this when they knew years ago what it needed to be. 279 miles? Strange because initial reports stated it had a 200 mile range. Oh, wait, my mistake, that’s the NEDC test cycle. Not a truly dedicated electric vehicle. M-B cheapened out. Yes but just for you to afford it! It’s not for efficiency. It’s because they were too lazy. Still. 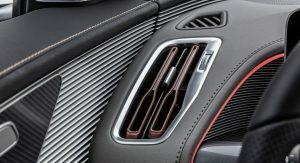 A frunk would have been cool and provide more storage. This car is already outperformed bei the ModX. And the dashboard/Cockpit looks quite interesting, with many buttons.. OMG. (! )Daimler obviously don’t understand EV.. Lets see when the first are on the roads..